Due to the backlog of existing commissions and slow rate of finishing paintings this year, no new commissions will be taken on until April 2014 at the soonest - and likely to be later than then. That means I’m not in a position to do any commissions for Christmas 2013. I’m aiming to have almost all existing commissions completed by the end of 2013. They are being continually worked on and many are very close to completion - but it’s hard to predict when any individual painting will be ready - holdups are largely due to having to do new paintings to make the rent just to hang onto the studio and the business (this is all I manage - if even), the little time I get to paint now compared to years ago, and losing momentum that both of the previous reasons cause when I finally get the time. A short video (less than 2 minutes) of me painting one of my Birds Wires pictures from start to finish. The painting featured is long sold. 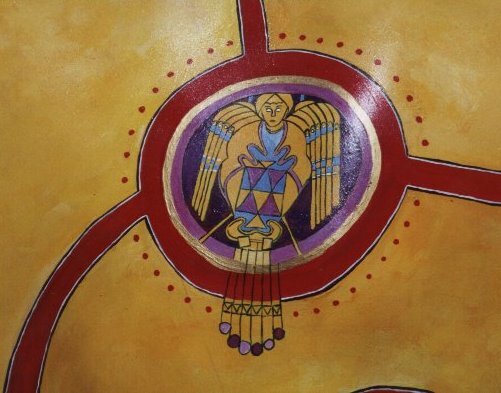 I’d like to make more - and with far better resolution next time - but it takes a bit of organising as well as being able to see a painting through to completion in a relatively short time (days rather than years), which is not my storng point. I’ve updated the page on prints and cards of my paintings to reflect the move to using Redbubble - which was prompted by the ability to offer cheaper shipping to people globally, especially in Ireland and Britain where most of my customers live. 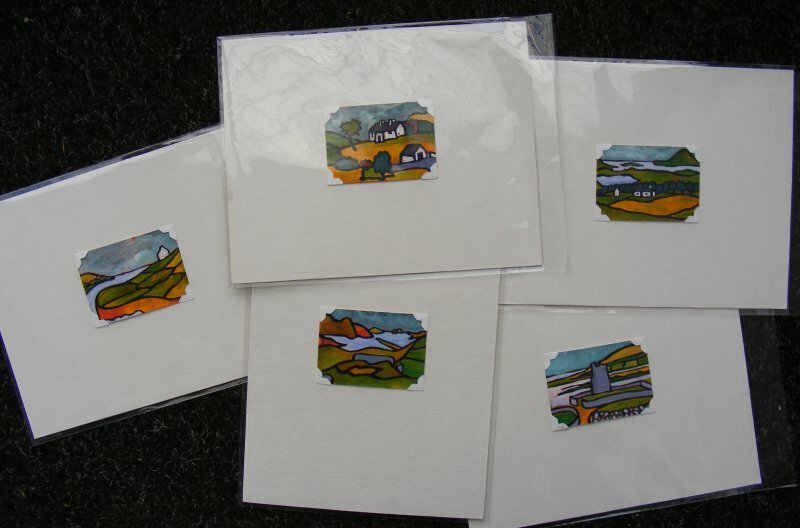 The cards are proving especially popular, priced at €2.79 for 100mm x 150mm with bulk discounts of 20% available if you buy 8 or more, or 30% should you buy 16 or more. Prices for photographic prints start from €11.41 for a small (270mm x 203mm) as of today. A list of paintings currently in progress. It’s long. Some are only an hour or so from completion. Others are closer to the other end of the spectrum. And some will have their names changed. As each painting becomes finished I’ll shove them down the end of the list and link them to the completed painting. If you’re expecting a painting and you don’t see it on the list, I haven’t forgotten to do it I’ve just forgotten to put it on the list - which I’ve compiled in my head rather than in the studio where most of the paintings are. I’ll add the others when I get to the studio. Because my studio is very cold which slows the rate of drying and I’d rather start a new painting than wait hours for paint to dry. Because things get in the way of painting and the only way to regain the momentum necessary to finish those interrupted is to start new ones. And because sometimes paintings just get stuck and need to be left and while that’s happening what am I going to do - apart from stare at them for months - but paint new ones? A painting of Ballyshannon in Donegal. This is a view I got from the bicycle as I crossed the River Erne. The weather was, em, changeable. 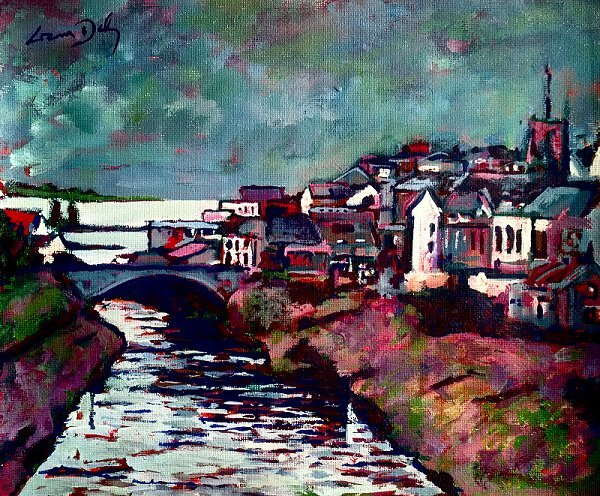 Ballyshannon is painted on unstretched canvas, 30cm x 20cm (12in x 10in). Unstretched canvas is where the canvas isn’t stapled to wooden stretchers but is flat and floppy like a sheet of paper. In other words it will require framing. Update: This painting is now SOLD. Work on current commissions including #paintingtour ones (and paintings for hosts), is continuing. Please note that due to current painting commitments any new commissions can not be completed for 6 months (which at the time of posting is mid September). The paintings depict the north Donegal coast from Bloody Foreland mountain to Horn Head, with the islands of Inishbofin, Inishbeg, and Inishdooey off Magheraroarty, and out beyond on the horizon the fabulous presence of the island of Tory. Donegal Coast 1 - In that brief spell when I lived in Donegal, the place I called home was 5km from the sea, a perfect distance for walks and cycling trips that showed off the coast. This 1st in this series of paintings features Tory Island, so dominant despite its distance from the mainland. Donegal Coast 2 - The islands of Inishbofin, Inisdooey and Inishbeg in north Donegal as seen from above Falcarragh. I loved watching them change in the light. Donegal Coast 3 - Looking towards Gortahork and Bloody Foreland from beyond Falcarragh. The colours of those hills, especially in the evenings, I found were like a slide show and the coastline itself changed shape with the light. Donegal Coast 4 - Another view of the islands of Inishbofin, Inisdooey and Inishbeg in north Donegal by Falcarragh, this time seen from a lower elevation from where I used to ride my bike. Such was the light and the sea that at times any one particular island could seem like it was in a different landscape from the other two. Donegal Coast 5 - Horn Head in north Donegal as seen from Derryreel. Beside a beautiful strand - that you can’t see in this painting - Horn Head is a fantastic rugged monster battling for attention on a coastline riddled with features I personally could paint for many years. The price for the 5 paintings together is €250. (Shipping & Handling is €15 or they can be collected from my studio in west Dublin). I won’t be selling them individually or breaking them up into any other combination. 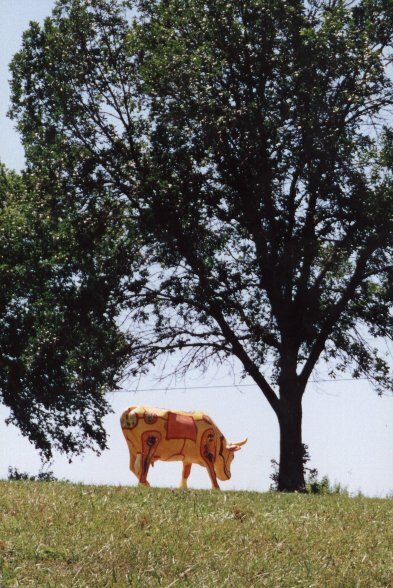 In 2001 I lived in Missouri and I painted a cow. 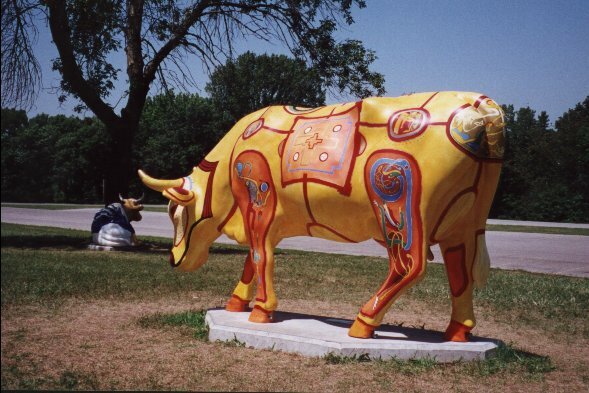 Before London, before Dublin, Kansas City was one of the very first cities of the more than 75 chosen to host CowParade. 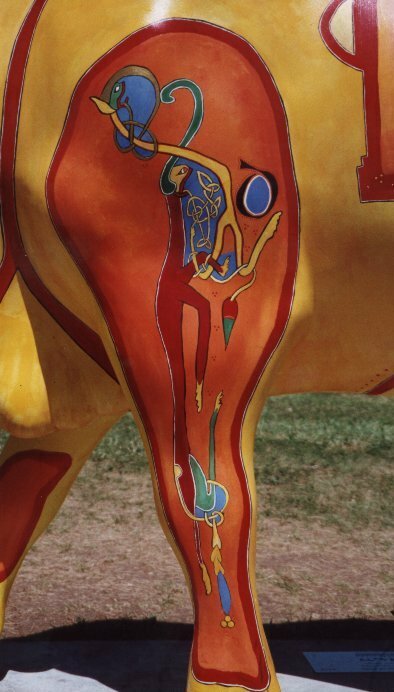 I submitted proposals for 2 cows, and one was chosen - “The Cow of Kells”, featuring designs and concepts from the most famous of illuminated manuscripts. 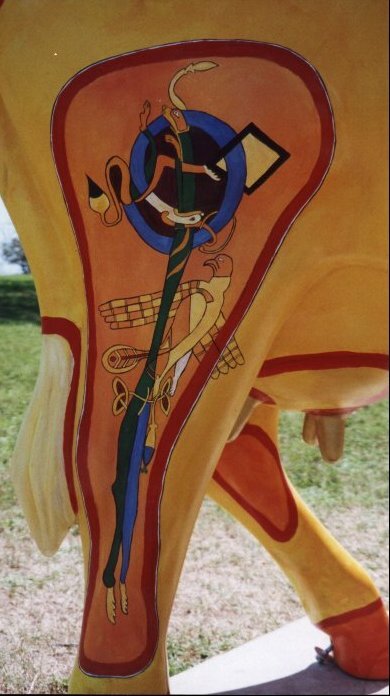 As well as painting elements found in the Book of Kells onto the cow, I tried to paint the cow overall in the style of how animals are represented in the book. The right legs were my favourite. Shawnee Mission Park is about 15 miles from downtown Kansas City, Missouri - over in the state of Kansas. I’ll confess to spending a couple of lunchtimes in the vicinity of my cow. 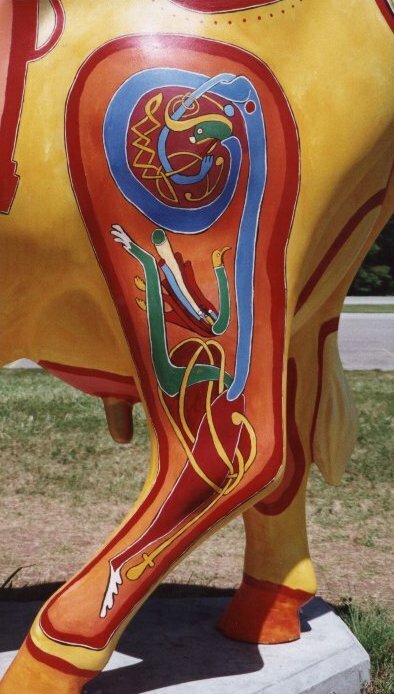 Never once did I hear how the cow was painted referred to as being Irish. 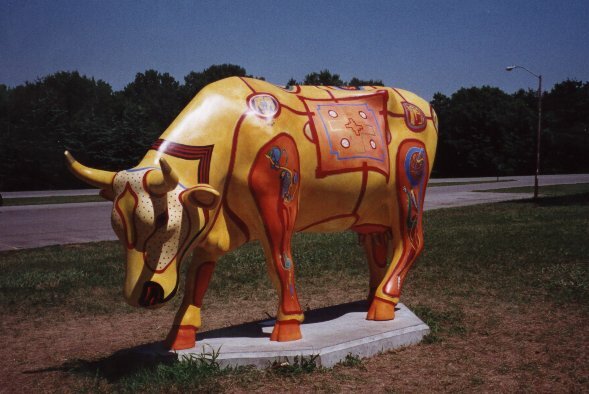 Most commonly I heard people call my cow ‘Native American’, ‘Egyptian’, and ‘Aztec’. 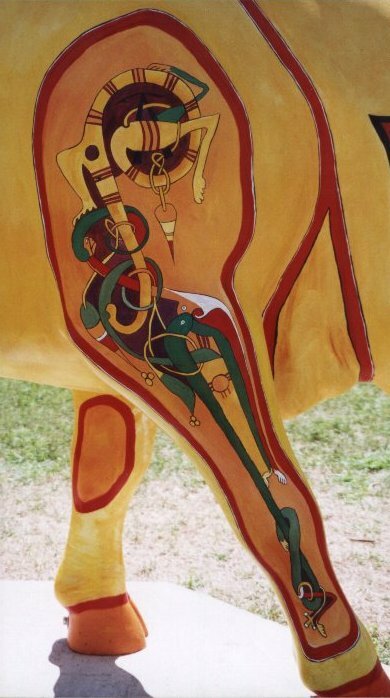 Painting a cow’s bum gold with three intertwined bearded men seemed like a no-brainer. I always wished I’d taken a photo of the space where the cow had been once the exhibition was over. 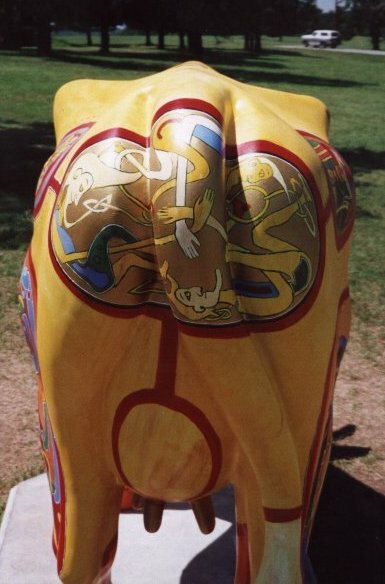 I painted a large rectangular panel on either side of the cow, with one of the panels blank. Rushing to make the deadline I ran out of time before varnishing so didn’t get to write on the panel in lovely Celtic lettering, “This panel left intentionally blank”. Sleep deprived and spaced out on fumes I then slept for most of the next 48 hours. 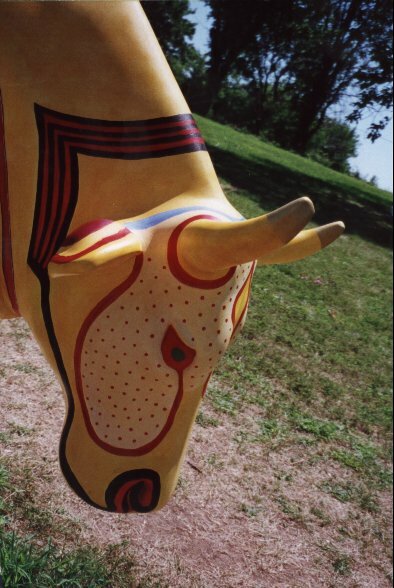 My other design, the one not chosen, was my preferred proposal - it was an abstract design featuring squares and called “Continental Cowscape”. Ultimately I used the name for a painting, and the design for a birthday card for my son. 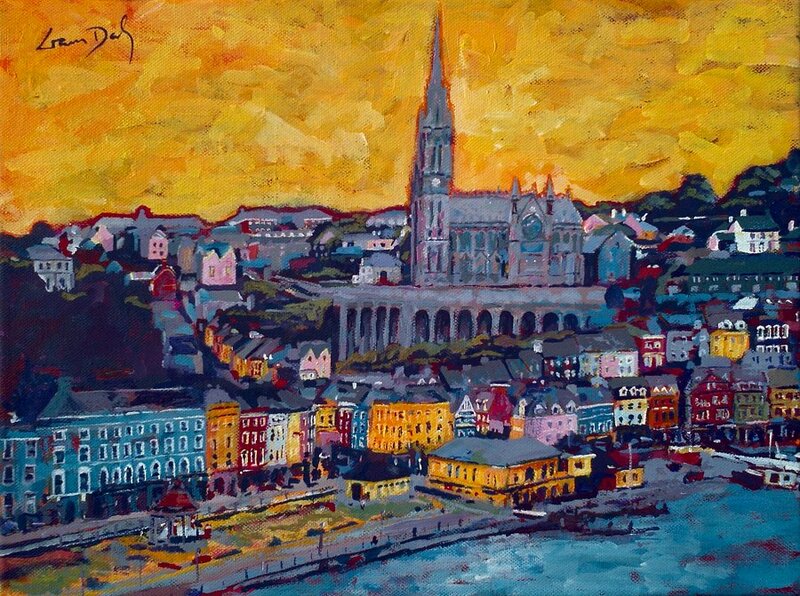 One of last year’s Painting Tour funding commissions was of Cobh - and when that painting is sent to America in a couple of days I’ll share it online with you. Here though, is another painting of Cobh, from a different viewpoint (a seagull’s) and unlike the one done on the tour this one was painted in the studio albeit drawing on the memories of that day’s painting in Cobh together with dozens of photographs. As of June 2012 if you’d like to commission a painting of this size it will cost you €175 or you could have a larger painting of 50cm x 40cm (20in x 16in) for €240. Ideally it would be of somewhere I have been (or can get to without costing too much), and perhaps with a selection of photos. Please note that due to current commissions I’d be unlikely be able to complete any new commissions for at least 2 months.